Nixon eventually released financial information to the public, and this became the new standard for presidential candidates in order to gain the trust of American citizens. Americans want to see their candidates’ tax returns mainly for the three following reasons: to see their income and tax rates, charitable contributions, and any potential conflicts of interest. Many voters are curious about how much income each political candidate makes and how much tax that candidate pays as a proportion of his or her income. This allows voters to gain a better general understanding of how the candidate makes his or her money. For example, is it through earned income or from capital gains? This idea also allows the voters to have a better understanding of a candidate’s net worth and if the amounts on their tax returns match up with what he or she is claiming publicly. Effective tax rates are also a point that voters seem to analyze. Voters like to see whether each candidate has a relatively high or low effective tax rate – meaning, how hard does the candidate try to reduce his or her federal tax liability? Charitable contributions listed on the candidates’ tax returns can confirm any candidate’s claim about how much he or she donated to charity over the years. The charitable contributions section of the tax return could also provide evidence proving that a candidate is less charitable than he or she led on during debates, interviews, and other public appearances. It also provides the details of the types of charities with which the candidate is involved. For example, Hillary Clinton released 8 years-worth of tax returns and donated mostly to the Clinton Family Foundation over that 8-year time period. 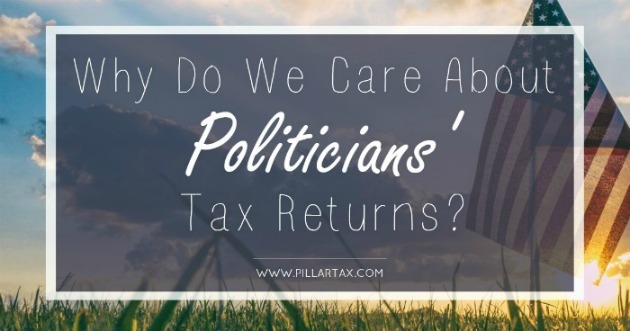 While it is clear that a candidate’s tax return can prove that individual is extremely wealthy, voters want to see where this money has come from over the years in order to identify any conflicts of interest. For example, a candidate receiving money from foreign entities in prior years could be a red flag for many voters. Donald Trump has business entities all over the world and could be making political decisions that would benefit those entities if elected president. In Clinton’s case, her Family Foundation receives a great deal of funding from overseas. Voters may feel like those foreign governments may expect special treatment if Clinton is elected president. As you can see, the release of a candidate’s tax return can tell a great deal about that candidate’s financial position. Tax returns are an effective way of disputing false claims or corroborating information that a candidate has claimed publicly.